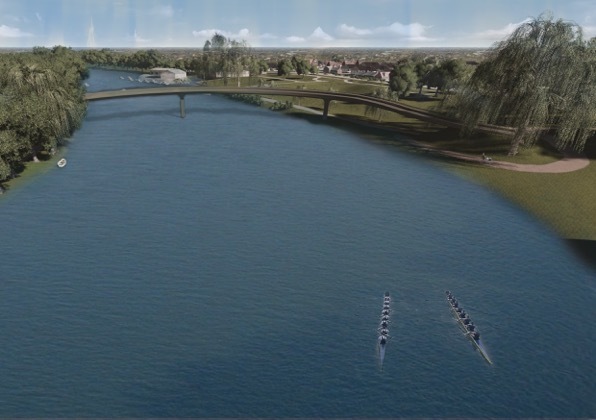 How would you like a new bridge across the River Thames between Twickenham and Ham? Obviously we’re not talking about a massive great road bridge here. We’re talking about a pedestrian and cycle bridge to provide better access to Ham or, if you’re already over there, to provide better access back to Twickenham. The idea is not new, in fact the Radnor Bridge brigade led by Mark Wing and Richard Woolf have been promoting the idea for several years, but it has gained more traction recently after being given an airing by Riverside Councillor James Chard at an El Brute council meeting earlier in September. The Radnor Bridge would link Radnor Gardens to Ham Lands and so improve access to Ham and Richmond. As well as simply providing a new route across the river, the bridge would give ‘Hamsters’ better access to Twickenham and Strawberry Hill stations and could form part of a wider plan to improve car-free transport options around the borough. What’s more, if the ‘sometimes-touted’ idea of a pontoon for Thames tour boats to stop at Radnor Gardens is also chucked into the mix then the bridge proposal gets even more interesting. You’re thinking, does it have to be at Radnor Gardens? No, but it might not be a bad spot for it. And we can expect that some locals and ‘friends’ might be concerned? Possibly. 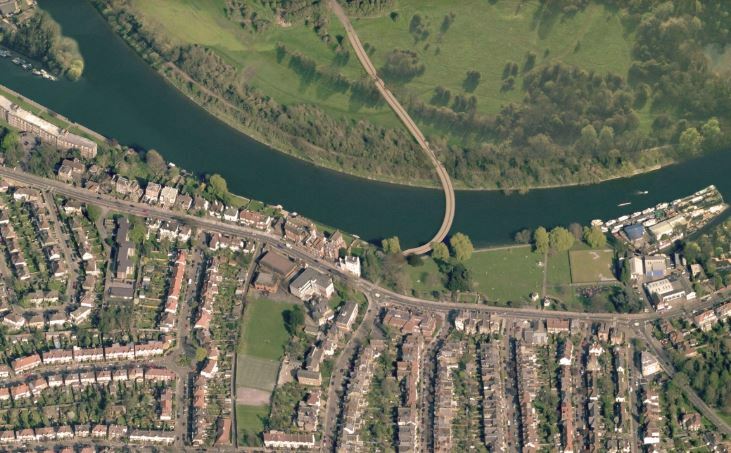 Another suggestion made is that a bridge could run from Ham to Twickenham Riverside next to Eel Pie Island. Or even across it! Imagine! Actually… imagine the protests. As for a detailed design for Radnor Bridge, well, apparently that can come later too. At the moment it’s just about the concept, the idea, the vibe of the thing. You likey? We ran a poll on Twitter asking what you, the twickerati, thought of the bridge plan. It received a healthy 600 votes with 85% of respondents being positive about the idea. Obviously polls can be unreliable but it did indicate broad support and a lot of local interest. But what of the cost? And will it actually get used enough to justify that cost? And what will the impact be on the nature of the Ham Lands environment? And what about the effect on Hammerton’s Ferry? Yep, all of that needs to be carefully considered but having more options to cross the Thames, especially as part of a well considered transport infrastructure plan, could bring a wide range of benefits. Here at twickerati HQ we reckon it’s something worth exploring in more detail. In other words, the fundamental question in all of this is: do Twickenham residents want to give greater access to God’s Own Outer London Suburb to people from the wrong side of the river? Tell us and tell us now. Vive la Twickenham! Vive la rive gauche! And, maybe, vive la rive droite too. Anonymouse: “Oops, you forgot to mention the £1.5million spent on consultations and the planning application for Fleming’s dull scheme”. That’s about the same amount that former Leader Serge Lourie spent on his very unpopular abortive scheme in 2008 – 2010. One has to face the fact that, like it or not, it is very costly getting such developments set up. The present administration has already committed over £210K just for the Design Competition, from “Uplift approved funds”. Can anyone explain what the latter phrase means? Anonymouse – as I am sure you know, the vast majority of the money spent by the previous administration on the Riverside scheme was for purchasing, at current market value, 1,1a and 1b King st and 2/4 Water Lane. So, the money has not “gone”; it remains in the form of this parcel of real estate, in the possession of the Council. Oops, you forgot to mention the £1.5million spent on consultations and the planning application for Fleming’s dull scheme. I see many comments saying how the bridge would benefit both communities. How? If the Hamsters come over to Twick to do their shopping then the local shops in Ham will suffer. I do not see the Twickerati trudging over to Ham to do their shopping (though perhaps a visit to Rowley’s bakery might be worth it). 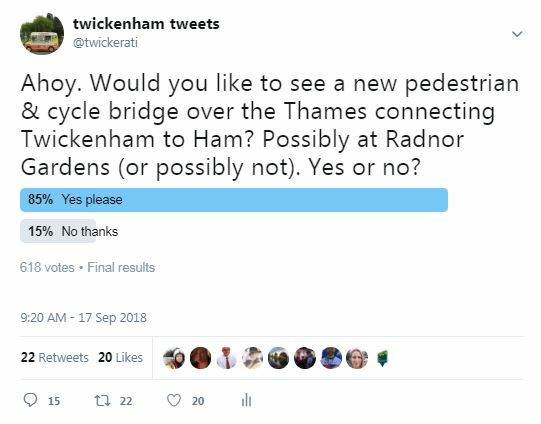 Be honest – the attraction of the bridge is for the Twickerati to have a short cut across to the Hamlands rather than crossing at Teddington Lock or Richmond Bridge. Has there been a consultation in Ham to see if they are in favour? People in Ham would surely “trudge” , or more sensibly cycle, over to Twickenham for those purchases that local shops cannot supply. Since you ask, yes. The Ham and Petersham Neighbourhood Plan consulted widely, and is in favour of a bridge. Gareth Roberts has said in various articles that the Council will be stretched financially to cover basic services: child care, elderly care, refuse collection etc etc. The idea of spending money (from reserves or increased Council tax) until there is better funding from national government, is irresponsible. I understand a new inexperienced Councillor wanting to raise his public profile but those getting excited about funding a bridge had best take a deep breath. Look at the Council accounts. Look at several previous schemes that have been surveyed (Denise Carr was the last Lib Dem Councillor to wave the idea around). Cllr. Roberts has talked about increasing Council tax – cost no more than a frothy coffee for each person. There are some people in our ‘rich’ Borough who cannot afford a cup of coffee – they rely on food banks. If Mr Chard wants to raise his profile he might start thinking about providing decent and permanent accommodation for rough sleepers. A bridge to a better life might be a better way to develop a reputation as a serious representative. Thanks for this – nothing like a bit of constructive criticism! Firstly, the logic of your argument is that there shouldn’t be investment in infrastructure even if the benefits over the life of the asset far outweigh the cost. As much as anything, that’s flawed economics. Secondly, as I’ve noted below and said when I raised this at Council, this will clearly need external funding. There are TFL funds available for cycling infrastructure, and have been Department for Transport schemes in the past. My colleagues and I will always make the case for local projects to get their fair share of available external funding. Thirdly, your argument presupposes that the new administration aren’t addressing the other issues you quite fairly raise. However, we are (for example) committed to reinstating the Council Tax discount for the least well off that the previous administration scrapped, reducing storage charges for families in temporary accommodation, and introducing grants to help people with mental health difficulties to live independent lives. On the local level, one of the concerns Roger, Julia and I had with the old Riverside development plan was the limited affordable housing provision. I could see your point if we were ignoring those other issues, but we are not, and there is nothing at all wrong in also discussing things like longer term investment in transport infrastructure. An excellent well considered response from James Chard. We need councillors like him to drive a constructive innovative agenda which was entirely lacking in the last moribund administration and its naysayers. Fall’n on th’ inventors’ heads.” …. Horatio was super keen to waste £millions on the last lot’s ill-judged and highly unpopular riverside scheme. It’s all a bit ‘rich’ of her to now start lecturing about council funding. Now that the riverside project has been cancelled, WHERE is all the money that was ‘earmarked’ for this?? The last lot spent more than £8million on it. That’s where the money’s gone. what I mean is…. they spent that money on the ‘thing’..
so WHERE is that ‘thing’ ??? eg, they bought an IDEA, but did not get a receipt??? That ‘thing’ is dead and buried thanks to the new lot at the council. Yes, they bought a few ideas (all bad), got receipts (that’s how we know how much they wasted), and they were sale only (no return). ps I’m still waiting to see your drawings. Illiad, I don’t think that will satisfy the brief, do you? 1 – When bridges are built, ferries close. That’s just the way it is. If the existence of a ferry meant we couldn’t build a bridge, we’d have no Richmond Bridge, no Richmond Lock Bridge, no Teddington Lock bridge and no Kingstson Bridge, all of which displaced a ferry. No Severn Bridge either, come to that. 2 – But, happily, with a Radnor Bridge I don’t think this would even happen. Hammertons will likely lose some cycling custom, but Radnor is too far from Hammertons to really impact the current traffic of people wanting to get between Ham House and Orleans. In fact the reverse, I think Radnor would create an obvious circular walking route for Twickenham residents – out one way, walk along the back, cross home by the other. So traffic could increase. Let’s get behind Radnor Bridge – if funding can be found Twickenham and Ham residents can only benefit. One vote for eel pie option … It would be great to connect twickenham Town centre to ham House and enable several great walking and cycling loops. The problem of people parking in Ham was raised at a meeting last year. It if encourages Hamsters to use the Twickenham side of the river train stations, this could lead to people driving to Ham and leaving there cars there all day. There is currently no parking restrictions in Ham. Can’t help feel money would be better spent. I see the argument, but doesn’t it rather emphasise how poorly connected Ham is to other parts of the Borough at the moment? The reason people from out of the area are unlikely to park in Ham now is that, if they did so, they’d face just as many problems as Ham residents in trying to go to other places! I also query how realistic the argument is. A bridge would certainly improve connectivity from Ham a lot, but it is hardly likely to make it a station car park for Twickenham Station given the location, both of said station and of parking spaces in Ham, relative to the river. It would be much more sensible to cycle across the bridge all the way to Twickenham Station. 1. In response to my raising the issue at the LBRuT meeting, the Council cabinet member for transport, Alex Ehmann, confirmed that a feasibility study (commissioned by the previous administration) covering several pedestrian/cycling bridge options had been produced but not published. That will be published very soon for public input (to be honest, I think the previous administration would have been getting wider views first to inform the scope of the study, but there we are). 2. Alex indicated that two of the options considered scored particularly highly and that the Radnor Gardens option was actually pipped by the eastern tip of Eel Pie Island option (mentioned by some people on the thread). 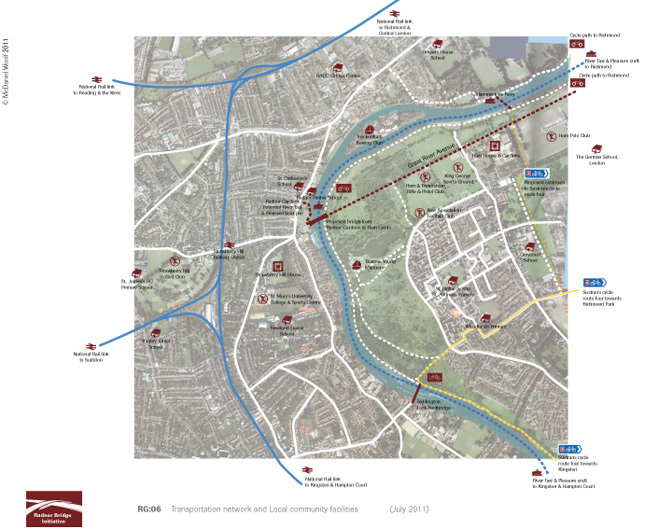 I do have some concerns about the Radnor Gardens option in terms of (i) greater environmental/aesthetic impact both there and on Ham Lands; (ii) distance from Twickenham Station and town centre, and suitability of connecting roads for children in particular; and (iii) a location a bit nearer to Richmond Bridge is a bit better in terms of reducing traffic congestion over that bridge. I’m genuinely open-minded and hope Radnor Gardens advocates will also be open-minded in the discussion on this. It’s also important to appreciate that, although the Radnor Gardens idea has been around for a while, it really isn’t a case of that or nothing. 3. I know some are sceptical on the costs and benefits, and it’s entirely sensible to demand value for money. I hope those people remain open-minded and look at the study. My own initial view is that the benefits are significant (e.g. reduced road traffic, reduced journey times, improved safety, opening up public transport options for poorly served “Hamsters”, increasing the popularity of Twickenham for visitors/shoppers, broadening work and educational options). A bridge is not cheap but a the build cost would be a tiny fraction of the £46m Boris Johnson blew on NOT building his Garden Bridge. Funding would clearly need to involve parties outside the Council – but TFL and Department for Transport have been involved in similar projects in the past. 4. In terms of impact on Hammertons Ferry, it’s not at all clear this would be negative. The hours of operation and crossing time mean that the ferry is less about transport connectivity, daily work use, reduced journey times and so on, and more about leisure. In general, I suspect anything increasing footfall would tend to benefit the ferry. Just checking. James, can you please confirm that you really mean the EASTERN tip of EPI. (i.e. by the White Swan)? Actually, my understanding (and I, like others, await publication of the report) is that the site assessed in the report is a bit further east due to flood risk and other factors directly next to the White Swan. I’d not take the study as determinative on such questions, though. I’d emphasise that this was a study quietly commissioned by the previous administration. My view is it would have been useful to have had more public discussion before commissioning a study to come up with the most appropriate range of options. But the study exists now, and does usefully look at the kind of things that might be feasible. Alex and I both wanted to get it out there and stimulate discussion about the idea generally (and, related to that, specific site issues). Might one result be that a bright spark identifies a different, workable site? Yes, it might. Thanks James. Putting 2 & 2 together it sounds like the site must be Orleans Gardens. The previous administration must’ve forgotten all about Glorianagate! BTW, when do you expect to publish the report? I agree that the impact on Hammerton’s ferry might well be to actually increase traffic. At the moment the lack of any towpath for cycling / walking to Teddington lock from Twickenham is a deterrent to walkers and cyclists whereas creating an off road loop would encourage them. For an idea of how significant these school run cross river trips might be, the latest allocation maps show that in 2015 13 places were allocated at Greycourt to children on the Middlesex side, 9 at Teddington and 18 at Waldegrave to children on the Surrey side (where the shortage of places is currently). That is in one year group at 3 schools, and making two trips per day. It could easily be in the hundreds. Why do we need a Twick and Ham pedestrian & cycle bridge, other than connecting two communities? *Teddington lock bridges are very narrow and cycle unfriendly (i.e. no cycling). *It’s a long way to Kingston Bridge which is polluted and has no quietway access on the Twickenham/Teddington side. *It will create another great circular route that includes Teddington lock. *Can be integrated with a ferry stopping point that will benefit both sides of the river. Some thoughts on the pros and cons of the two potential bridge locations. *The bridge would have to go from Wharf Lane, over or around end of EPI. It would have to rise up high over the main stretch of river (Ham side) to clear boats. *Wide stretch of river. Indirect route. *It may be the best link option to Twickenham town centre, but would damage Hammertons business (probably fatally). *Has the advantage of bridging from the elevated Cross Deep road to clear boats. *Cycle improvements needed along Cross Deep. Ideally, a two way segregated track to King Street/Wharf Lane. Sorry – nope. You would say goodbye to Hammerton’s ferry. You can cross at Richmond and/or Teddington. Improve cycle lanes rather than building a bridge. Agree. Nothing wrong with Teddington lock. Get off yer bike and walk a few yards. Richmond bridge – can’t see the problem there either. Pedestrians use it – I don’t see them moaning about pollution and asking for a pedestrian-only bridge. If you don’t like the transport links, move somewhere you do like instead of building random bringes to suit yourself. What about a tunnel UNDER the river. Who’s thought of that? Or a tunnel under the river and a bridge. Next to the LIDO. With Hammerton’s replaced by the Gloriana. The existence of a ferry at a location is a good indication of the need for a better crossing at that location. In a remote location a ferry may be adequate but in this position between two historic houses it is amongst other attractors it simply isn’t. Paul – if you are saying that the existence of the ferry indicates a need for a crossing, then by extrapolation you are suggesting that is where the bridge should go. If so, then Hammerton’s will close. Yep. There were ferries at Teddington and Kew which were replaced by much more convenient bridges. If there is the demand for a short river cruise that should not be confused with the need to get across the river quickly and easily. You are comparing chalk and cheese. Hammerton’s ferry is a leisure business, attracting visitors and great for a sunny afternoon in the summer but of course only if it is a weekend in winter. Of no use whatsoever to people traveling home from work or school on a winters morning or evening, or travelling over the river for other non leisure reasons. The only people who I have known use the ferry for anything but a joyride worked in Ham House! They serve entirely different markets. I am sure that further studies will look into the feasibility on economic grounds looking into all the sectors of our local economy, and I suspect for all sorts of reasons a bridge originating in or near Marble Hill would be a non starter anyway. A bridge further east with safe access linked to safe cycle and foot routes (and neither Teddington, Richmond or Kingston bridge meet those criteria even if anyone could be bothered to walk or cycle to them which they won’t, they will get in the car) would I am sure be well used and a benefit to the local economy, strategic planning for local government services like education and infrastructure. The availability of another safe leisure route further along the river would actually benefit Hammertons. I agree with the suggestion that if there were to be a bridge it should be at the end of Eel Pie Island, maybe included in the proposals for the riverside redevelopment. Which end would that be? The bird sanctuary or where there are homes? No thank you. Don’t see the need for it. Leave Radnor Gardens alone. As for it being ‘unsafe’…keep an eye on your children. Keep an eye on your pushchairs. There is a path for a reason. If you go off the path onto the riverbank, you may fall in. no problem with a foot/cycle bridge. It needs to span from Cross Deep to Riverside Drive over Radnor Gardens,then far enough into the Ham Lands to connect with Riverside Drive, avoiding any flooding both sides, and tall enough for large vessels to pass under at high tide; which is when the passenger steamers use this stretch of the river. As to cost, not sure, nice if we could afford it. Yes to the bridge. Happy to contribute to a crowd-fund. Perhaps it could be a toll bridge until it’s paid for – same price as the Ham Ferry. Pontoon sounds like a good idea too. It’d be nice to pick up a ferry from there to Richmond or Hampton Court. But even if neither of those things happen, the Riverside at Radnor Gardens needs to be made safer. How many parents have had a heart-to-heart moment when walking that path with their toddler or buggy? And wasn’t there an incident a while back when someone in a wheelchair went over the edge? Pontoon! Here we go again. Learn about the river tides and undercurrents. …..
What’s the environmental impact on Radnor Gardens? If it means tree felling, as some images suggest, then it would have to sit entirely ‘offshore’ and start from a structure built on the River. Trees grow back – if we had to replant a couple of trees in order to significantly improve walking and cycling transport in the area, that would surely be Ok? It would be madness to worry about environmental impact and then build a complete neddless structure in the river to protect a couple of trees. I’ve been waiting for such a bridge for years as it would massively extend walking/cycling possibilities, but the Radnor bridge suggestion looks massive. Ideally (no idea about feasibility) I’d like the link at the end of the Twickenham Embankment, linking to the eastern tip of Eel Pie Island and then to the Ham side (i.e. having two small bridges). That would allow pedestrians and cyclist to stay on paths instead of using roads (Wharf Lane and busy/unpleasant Cross Deep). Isn’t the east end of EPI a nature reserve with no direct access to the main island? I suppose a bridge with no exit point on the island is possible but I would expect a lot of opposition compared to a crossing at Radnor. should welcome the Hamsters. Maybe a revolving wheel could be included to enable them generate power for the bridge lighting.